It would be easy to describe the Sonos One as the best of both worlds, in combining the intelligence and smart home skills of Amazon Alexa with the networking capabilities and excellent sound quality Sonos is famous for. It would be easy for us to go so far as to say the Sonos One is the perfect intelligent speaker, and the ideal starting point for any smart home. But that wouldn't be entirely true. 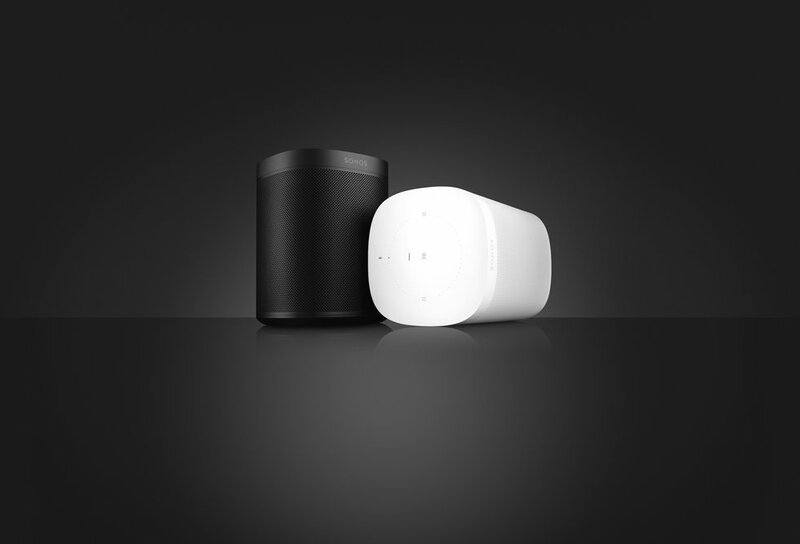 While the Sonos One gives much with one hand, it also takes away with the other. It has far superior sound quality compared to Amazon's own Echo speaker range - and can be combined with other Sonos speakers to make a truly formidable whole-home audio network - yet doesn't quite offer the same amount of features. Should you buy the $199 Sonos One, or should you pick up a $49 Echo Dot and connect that to the speakers you already own? Read on to find out. At just over four pounds, the Sonos One is a hefty speaker. It doesn't feel chunky or cumbersome, but is reassuring heavy and weighs around twice as much as the second-generation Amazon Echo. The One is compact at 6.4 inches tall and 4.7 inches square, with rounded edges. Available in black or white, it looks sleek and will likely fit in wherever you put it. There are four rubber feet on its base to keep the One stable and the power cable slots neatly into the base. The top and bottom of the Sonos One are plastic, while the speaker grill and rear are painted metal. We discovered this after noticing a couple of gray scratches on the back, caused by the power plug accidentally grazing against it while being carried. It's unlikely that you will move the One around much, but be warned - the metal section's paint scratches off easily, and on our white version this is quite obvious. Setting up the Sonos One is a little more involved than with other Sonos speakers, like the Play:1, but it is still simple. Plug the speaker into a wall outlet and download the Sonos app to your iPhone or Android, then open the app and do as it says. This will take you through the process of connecting the speaker to your Wi-Fi network — or via the included Ethernet cable if you prefer. You'll be asked to create a Sonos account, then log into your Amazon account to get Alexa set up. There is also a step for adding access to over 80 music streaming services to the speaker, including Spotify (which wasn't available when the Sonos One launched) and Apple Music. Finally, the Sonos app will suggest you tune the speaker so that it performs best in your chosen location. The speaker plays a series of loud test tones for 45 seconds while you walk around the room, waving your smartphone around. Using your phone's microphone, this tunes the speaker to the specific acoustic of the room. The state of tune the app decides on can easily be switched off if you don't like the results, or if you put the One in a different location. 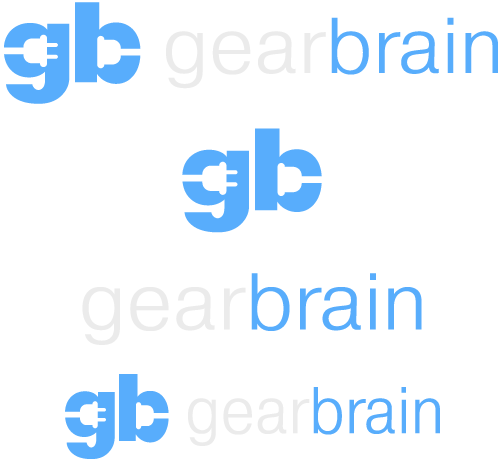 If you move the One permanently you can always go through the tuning process again. Although you can use Alexa and voice commands to control the speaker, there are also some touch-sensitive controls on the top. These include play/pause, skip to the next or previous track, adjust the volume, and switch the microphone on or off - handy for the privacy conscious, or for when a nearby television might wake Alexa unintentionally. If you opt to connect the One to your router via the Ethernet port, you can create a dedicated Wi-Fi network for future Sonos speakers to connect to. This helps to maintain a solid connection between Sonos speakers when spread across a home packed full of other Wi-Fi devices, which can potentially interfere with the music. 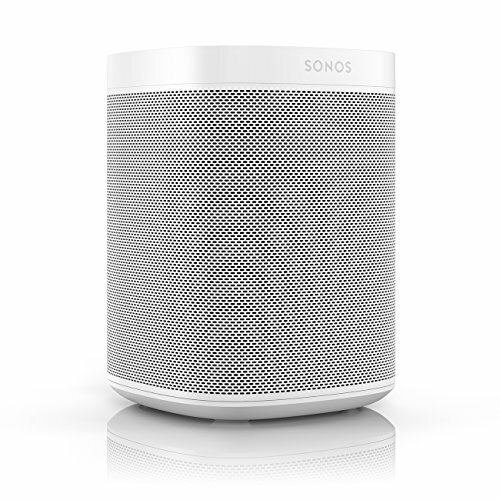 For its compact size, the Sonos One has excellent sound quality. Bass from the single mid-woofer is punchy and deep, while we've yet to find high notes not within reach of the tweeter. You can turn the One up to neighbor-angering levels without sound being distorted and it has the power to fill a room all on its own. There is a depth and clarity to the One's sound which immediately says 'quality', vocals have warmth and texture to them; we really couldn't find a music genre that caused the Sonos to struggle. 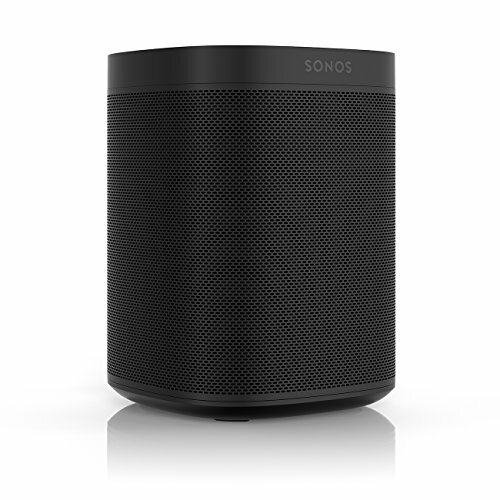 Stereo sound can be produced when two Sonos Ones are paired, using the Sonos app. Of course, the biggest reason to buy a Sonos One over any other other speaker at this price is Alexa. And this isn't just Alexa support, like with the Sonos Play:1 which can be controlled by talking to an Amazon Echo on the same network. The One has an Alexa all of its own - no Echo required. However, contrary to what you might think, the One's version of Alexa isn't quite the same as that used by Amazon's own Echo speakers. The One cannot call Echo other devices and cannot drop-in on them either, which is a shame given how this feature essentially turns a collection of Echos into a home intercom system. More annoyingly — especially given the One is first and foremost a music speaker — it cannot be added to an Amazon Multi-Room Music Group. We have an Echo Dot in our lounge and another in the office, each acting as their own group (called Lounge and Office). We can ask Alexa to play music in either group, or play music 'everywhere' to play out of both at once. However, the Sonos One cannot do this and cannot be added to the Everywhere group. This means, if you were to buy several Ones and put them across the house, asking Alexa to 'play music everywhere' would not work. As a compromise, you can call the Sonos One 'Bedroom' in the Alexa app (or name it after whichever room it is in), then tell Alexa to 'play music in the bedroom', and she will. Thankfully, the One can be added to a Smart Home Group, giving it control of a bunch of devices like smart lights and window blinds. The One's six far-field microphones are excellent at picking up our voice over loud music. When we can barely hear ourselves saying 'Alexa', the speaker picks us up, lowers the music, plays a chime to say Alexa is listening, then waits for us to speak. She sometimes responds to lyrics played by the music, but this is a fault of the Echo range too — along with occasionally replying to the television by accident. The rest of the time, Alexa on the Sonos One works just as she does on Echo devices. If Alexa isn't for you, then we have some good news — Sonos will be adding Google Assistant to the One later this year. We don't know how this will work just yet, and whether the speaker will be listening for 'Alexa' and 'Okay Google' at the same time, or if you will have to pick one from the settings menu. 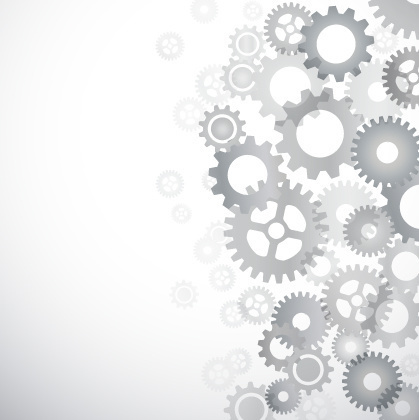 But either way, it makes the One attractive to a whole new smart home audience. The Sonos app can be used to play music through the One — and any other Sonos speakers you have — from a wide range of streaming services, or from playlists stored on your phone. You can send different songs to each Sonos speaker you own, or have the same track play through them all at once — something Alexa on the Sonos cannot do, as we explained above. There is also a global search function where you type in an artist, song, album or playlist and the app returns results from all services you are subscribed to. The app is always where you can set alarms and timers (if you don't want to use Alexa for the same task), retune the speaker when relocating it to a different room, adding new music services, and adding more Sonos speakers to your system. The One has a regular retail price of $199, but for a limited time Sonos is selling two for $349.99 - the same price as the Apple HomePod, a Siri-powered speaker which goes on sale next week. Buying two gives you stereo sound and Sonos' excellent multi-room audio support — neither of which the HomePod will be capable of at launch, even if you shell out $700 for two. We're yet to listen to the HomePod, but already know Alexa is a more capable assistant than Siri, so the pressure is on for Apple to convince consumers its speaker is the better option at twice the price. For now, the Sonos One remains a truly excellent speaker in its own right. Factor in Alexa, voice controls and smart home integration, and even $199 sounds like a bargain for what's on offer. It isn't quite the full Alexa experience, as the Sonos cannot call up Echo speakers or drop-in on them. Sonos might add this via a future software update — just as it did with Spotify and the Alexa daily briefing feature, which weren't included at launch — but then again, it might not. We can understand Amazon wanting to keep some features unique to its own Echo devices. At $199 the Sonos One is sitting proud, comfortably above the Echo, Echo Plus and Google Home, but well below the Apple HomePod and Google Home Max. For those wanting to give Alexa better audio without the inconvenience of hooking up an Echo Dot to other speakers — if you don't own speakers of this quality already — the Sonos One is the perfect package.